MIAMI - U.S. prosecutors claimed that two nephews of Venezuela’s first lady sought to carry out a multi-million-dollar drug deal to obtain a large amount of cash to help the family stay in power, court documents showed. The claim appeared in a motion filed late Wednesday in Manhattan federal court in the case of Franqui Francisco Flores de Freitas and Efrain Antonio Campo Flores, nephews of Venezuelan President Nicolas Maduro’s wife, Cilia Flores. The defendants were arrested in November 2015 in Haiti and are fighting charges that they tried to send 800 kg of cocaine from Venezuela to Honduras enroute to the United States. Prosecutors said recordings of meetings involving the defendants showed they were seeking to counteract money they believed the United States was supplying the opposition ahead of the December 2015 National Assembly elections. Maduro’s Socialist Party at that time feared losing its parliamentary majority, and did so after the vote. Lawyers for the defendants declined to comment on Thursday. Prosecutors said that statement was made during meetings Campo Flores, 30, and Flores de Freitas, 31, had in October 2015 in Carcas with two informants working undercover at the direction of the U.S. Drug Enforcement Administration. Details of the recordings have emerged ahead of jury selection set to begin on Wednesday in their case, which spilled out of a series of U.S. investigations linking individuals connected to the Venezuelan government to drug trafficking. They contended the “highly politicized statements” had no value as evidence and came only after a Drug Enforcement Administration informant mentioned the elections and cited Cilia Flores, a former president of the National Assembly who at the time was running as a legislator. 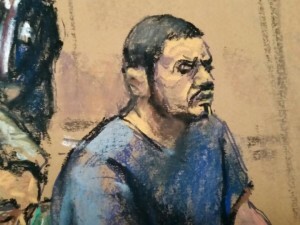 Photo: Franqui Francisco Flores de Freitas sits in federal court in Manhattan, New York, December 17, 2015, in this courtroom sketch.